We had gone to bed early, and we were both up at dawn today. We had committed to an early start and to get as much walking in as we could before the hot sun rose high enough to make our day miserable. Breakfast hadn’t been a popular meal the day before, but we both knew we needed calories today so we forced down some oatmeal and started packing up quickly as we watched the first-light of the day get brighter. Upon waking, we just sorta sprung into action packing up and getting ready for the day and didn’t really discuss how either of us were feeling about continuing. Perhaps it was just obvious to one-another that we were both all-in, or maybe we were both too scared to ask the other for fear of getting the response that we didn’t want hear. But we were moving much quicker than the morning before – and I venture to say we were both feeling great. What hadn’t I noticed, you say? Nothing! For the first morning in days, there was nothing to take note of. I had woken so completely uneventfully, with no spinning sensation or overwhelming nausea or any ill feelings whatsoever that I had not even noticed that normalcy had returned. Oh the glory of feeling normal after one has felt so un-normal for so long. My vertigo was gone, and though I could have taken the popular saying literally and actually shouted from the mountaintops in joy, I chose instead to have a private celebration. Caitlin and I were both so relieved, and as she tended to her large blister she admitted she was feeling quite good and optimistic as well. It was shaping to be quite a good day. We were back on the High Sierra Trail as the rising sun kissed the highest peaks of the Great Western Divide that surrounded the lake. In all of our layers and gloves, we moved forward and upward winding our way to the north side of the lake through the cold morning. The morning sun hitting the granite sentinels of Valhalla was quite stunning. The morning shade proved to be the perfect blessing. Though the climb was steep, it felt so much easier without having to battle the heat of the sun on the granite. The view back down to the west was pretty remarkable. We could see all the way down to the (smoggy) Central Valley, and the trail we had walked the past 2 days cut into the canyon wall, and even Moro Rock in the distance – very close to the start of the HST at Crescent Meadow. About an hour and a half into our trek that day we came to a sight on the trail that I was looking forward to: the infamous tunnel. This section of trail was nearly entirely blasted out of the vertical walls of the granite cirque surrounding Hamilton Lake. Nearly the entire stretch of trail between Hamilton Lakes and Precipice Lake proved to be quite impressive in it’s construction. The walls of the cirque surrounding the lake are sheer and steep, and having to construct a trail wide enough for pack trains to navigate in this terrain was surely a huge challenge. Crossing through the tunnel, we stopped short of the next corner on the trail, as just beyond, we would be passing through our comfortable curtain of shade into the blaring sun. We shed our warm layers and prepared for the onslaught. I quickly forgot about my dreading of the sun as we rounded the corner and the sheer granite walls surrounding us gave way to a gentle sloping mountainside carpeted in lush green grasses and wildflowers of every color. It would prove to be the most beautiful stretch of trail we would encounter on the entire High Sierra Trail. The peaks of the Great Western Divide in front of us were the most beautiful backdrop, the roar of the waterfall leaving the outlet of Precipice Lake ahead as our soundtrack, and every color of flower bursting around us – we were finally in the heart of summer in the High Sierra. We had arrived. 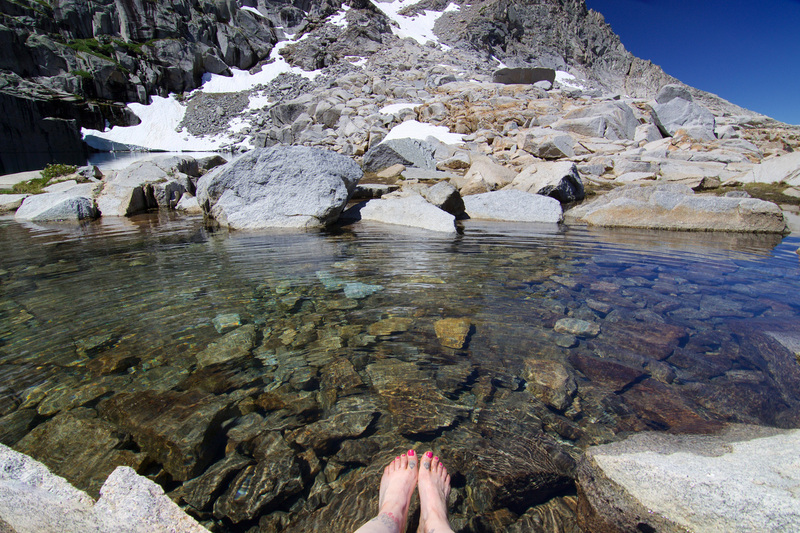 It was everything as John Muir described it to be in My First Summer in the Sierra. It was what I had come to this trail for, and all cares and thoughts disappeared. It was heaven. We still had a steady uphill to Precipice Lake, and even more to the top of Kaweah Gap, but with the countless stops for photos, the breathlessness of the uphill walk was hardly noticeable. I stopped to take in the last view of Hamilton Lake. The trail picked up a much steeper ascent from here as we rounded the base of Eagle Scout Peak. A beautiful unnamed lake stood below. As more classic High Sierra scenery unfolded around us, I was in love. As we pushed ahead I turned to say goodbye to the last glimpse we would have down towards the the west before we headed up and over the gap. And before we knew it Precipice Lake was laid out before us like a gem. 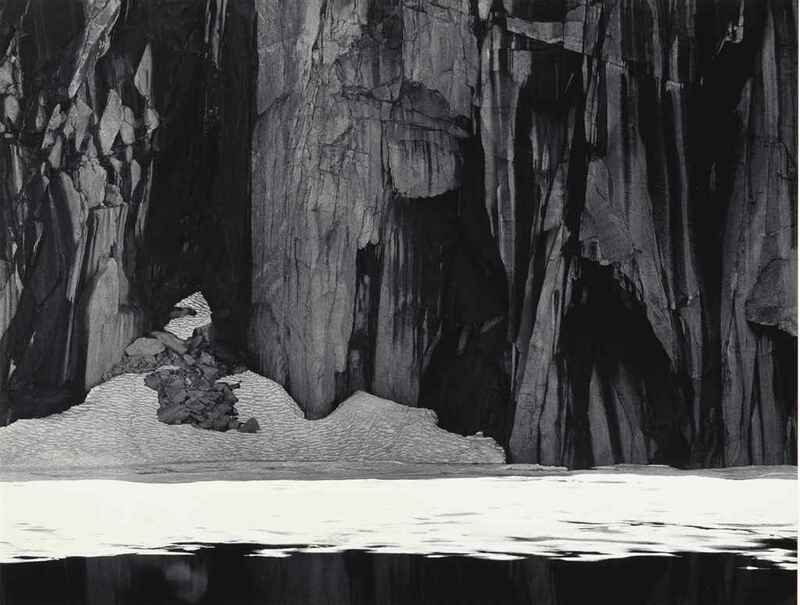 Precipice is famously known for being photographed by Ansel Adams. It’s a truly stunning alpine lake, with sheer water-stained cliffs rising from it’s depths on the southern shore. It reminded me a bit of Chasm Lake in Rocky Mountain National Park at the base of Longs Peak, and of Emerald Lake to the northwest, also in Sequoia National Park – but definitely holding it’s own with it’s rainbow-colored shoreline, and emerald and sapphire colored depths. A special spot for sure. As we walked to the shoreline we were graced with an impressive rockfall on the opposite side of the lake. Rocks breaking free from the mountain above and booming as they splashed into the lake below. I love catching rockfalls (when they don’t put anyone in danger, obviously), as it’s falls like these over eons that eventually shape the landscape. We gladly dropped our packs, took off our shoes, and enjoyed a nice long lunch break on its shore. 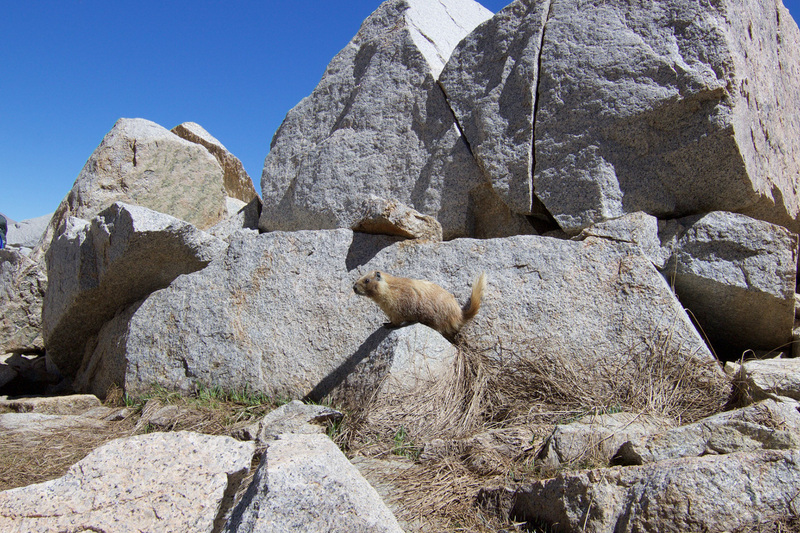 A sneaky, and nearly blonde-colored marmot (the lighted coat I have ever seen on a marmot), hovered closely by us waiting for us to turn our backs so he could steal our food. Evidence of his previous success was found in an empty bag of skittles that was lying close to his hole that he had surely stolen from another hiker. This would be the first of many wrappers, unfortunately, that I would find and pack out along the trail. Pack out your trash, people! Another hiker walked up and joined us as we were wrapping up our break and we chatted with him for a while. He was out in the backcountry, not hiking the HST, but heading over Kaweah Gap and scrambling into the picturesque Kaweah Basin for a few days. One of these years I hope to set aside time to explore some of the un-trailed wilderness of the Sierra. Arguably, some of the most beautiful, and pristine, corners of the Sierra are without trails to them – and for good reason. We had decided the night before that Precipice would be our deciding point about whether to turn around or continue. Though my vertigo had passed, Caitlin’s huge blister was far from going anywhere. She was going to use the climb out of Hamilton to gauge how it was feeling and if she could continue to Mt Whitney on it without too much misery. I asked her nervously for the answer as we sat by the shore if she was feeling like she could continue. She said it was actually feeling quite comfortable wrapped up the way she had that morning, and without hesitation she said she was up for the 55-ish miles ahead of us. The relief was amazing. After a rough two days, we were finally feeling great and looking forward to the walk ahead of us. After about an hour break, we lifted our packs back on and head up for the last bit of the climb to the top of Kaweah Gap. We crossed a snowfield above Precipice Lake and from there walked out into the most breathtaking Sierra scene. 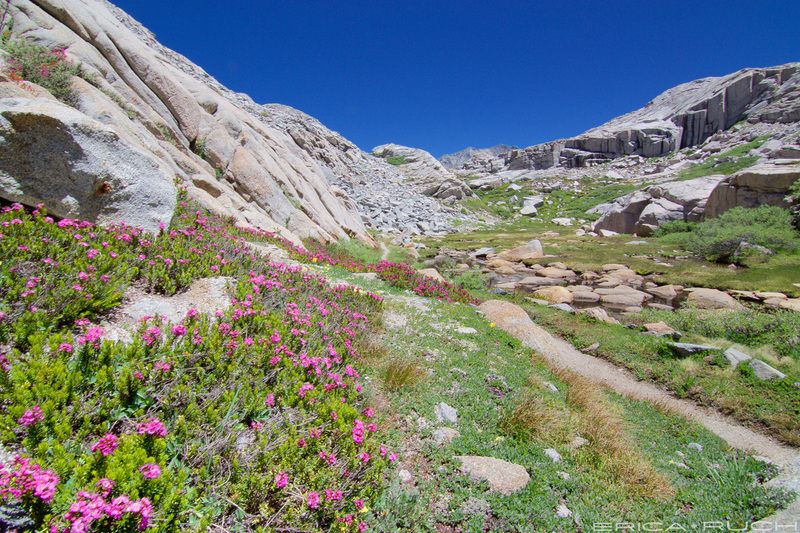 The narrow trail, wound its way along the shore of crystal clear tarns, surrounded by green grass, large boulders, and vibrant wildflowers. The peaks of Mount Stewart and Eagle Scout looming above. We were in awe with every step we took. It was a relatively short jaunt from Precipice to the top of the 10,700’ Kaweah Gap, and we took another break at the top to take in the views. Below, Nine Lakes Basin was laid out before us. I wish we could have scheduled a night here, as after scouring the map of the area, the lakes tucked into the basin around us (out of our view) looked likely incredible based on the map. Looking East down the canyon of Big Arroyo Creek, you could plainly see how glaciers had once plowed down from these mountains and scoured the landscape below. From there it was largely all-downhill for the rest of the day, and after 2 days of moving entirely uphill, we were grateful for the break. As we made our way down, it started to get pretty hot…not unbearable quite yet, but noticeably hot. When we made it to the first crossing with Big Arroyo Creek we decided to get some hiker air-conditioning, and dunked our long sleeve shirts in the cold creek (this also works quite well with hats). It’s always frigid when you first put your shirt back on, but it’s amazing how nicely it cools you off until it dries. Our stop didn’t last long though because for the first time (and actually, pretty much the only time on the hike), we were swarmed with mosquitos when we stopped. Eagerly we hauled out of there. About 30 minutes later, after crossing the creek for a second time, I started to really feel the heat. The cold creek rushing along side us was beckoning me. Then I spotted a beautiful deep pool on the creek that was calling our name, and we left the trail to head over for a swim. It was so delicious looking, and even had a natural waterslide on the rocks upstream from the large pool. After rinsing ourselves off away from the creek (always rinse yourself off before entering any water source so you don’t contaminate the water with sunscreen or bugspray – Leave No Trace! ), we slid into the creek on the natural waterslide, swam for a bit, laughed a ton, and lay in the sun on the rocks. This day couldn’t have been more perfect. When we finally left our oasis it was near 4pm, and it was hot hot hot. We had dunked our hats and shirts before leaving, but even that wasn’t much of a match for the heat of the day. Much like the day before, the heat drained us and soured our morale a bit. The trail soon left the river to climb up yet again – and neither of us were thrilled for the climb at all. My umbrella went up again, but as the sun was falling lower in the sky directly behind us to the west, it was beating on my back and legs and the umbrella wasn’t much of a help. The landscape here transitioned to a landscape I was familiar with from previous time spent in the Sierra in this area. It was so dry, the soil a sandy, coarse, granite, cooked and hot from baking in the sun all day. The pines and firs, barren and twisted, providing little shade. On the JMT, coming down from Forrester Pass the landscape was similar to this. This seems to be a common type of forest found on the western side of the southern Sierra. 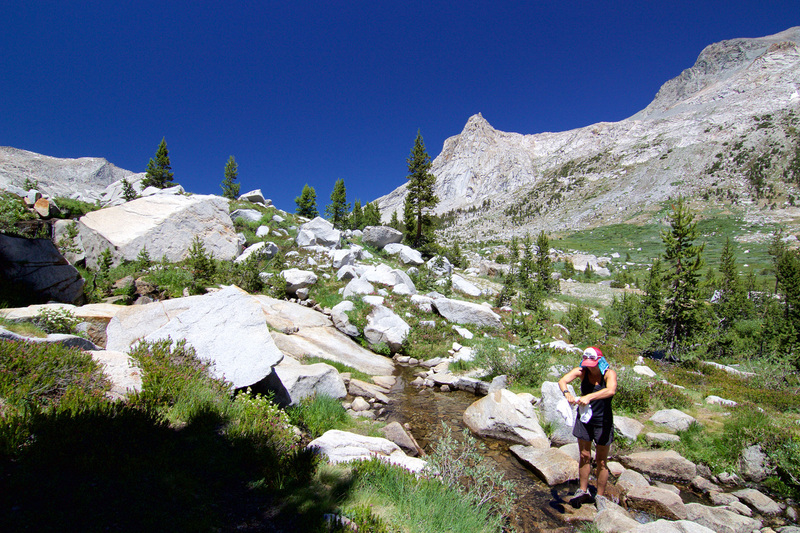 On the JMT, when Friz and I entered this zone, we became somewhat grumpy. Neither of us liked the “vibe” of the forest on that hike – and on this hike, Caitlin and I felt quite similar. There’s just something weird and slightly unsettling about it – maybe it’s too quiet, or too dry – I can’t put my finger on it. With about 4 miles left to the day, we were both pretty done. At this point it we were on a mission just to be done for the day and out of the sun. We passed some beautiful wide-open meadows. In the rush downhill, I mis-read a sign at the trail intersection with the Moraine Lake Trail, and we ended up veering off to Moraine Lake instead of following the HST. I kept watching the mileage on my watch feeling like we should have hit the next trail intersection already – then I looked off to the right, and through the trees saw a large lake. I was very confused initially (because on the HST, there is no lake in this area), but soon realized what had happened and that we were actually looking at Moraine Lake. Fortunately, this detour is not an issue at all as the trail meets up again with the HST just .5 mile down from the lake and only adds .6 miles. Seeing the lake, I’m not sure why it isn’t apart of the official HST. It’s a beautiful, welcome body of water in a thirsty landscape with few water sources. I’m sure the lake is relied on heavily by the wildlife in the area. We were so glad we had actually made a wrong turn! The lake level was low (likely due to the drought the past few years), and there was a nice sandy beach just steps from our campsite. A couple hikers we recognized from Hamilton Lakes were camped down the shore from us. We set up our tents and settled into camp. I was grateful to be done hiking for the day, for us both feeling well enough to walk the remaining 45 miles, and for the beautiful scenery and amazing experiences of the day behind us. Standing on the shore of the lake and pondering the surrounding peaks and our location on the map, I realized how remote this lake really was. It’s a far walk from everywhere, with the nearest road a few days walk in any direction. I had thought Evolution Valley was the most remote point in the Sierra, but I now think this area might be it’s rival. Now living in Colorado, and spending so much time in the Rockies, where it’s tough to walk even 15 miles in the mountains without a 4wd road crossing, I truly appreciate the Sierra for how undeveloped these mountains are. When the sun set, we stashed our bear canisters, crawled into our tents, and the night was warm and silent. Just started reading your blog and I LOVE IT! Thanks a million! I’m a backpacker myself, as well as being a neurosurgeon. I know both from treating patients and personally how debilitating vertigo can be. You might be interested in reading about The Epley Maneuver to treat it. It’s a simple thing you can do yourself without using medicines. You can find all the details by googling it. Now let me be perfectly clear: you are not my patient, I am not treating you, and I’m not giving medical advice. To do so would be illegal. BUT, it would be good for you to do some research on your own? Please keep hiking, and writing. And good luck with no more vertigo. PS- please don’t post my note for obvious reasons. Thanks so much, John! I had actually received this information from my dr the first time I had gotten it years ago, but forgot the maneuvers! Since I know I’m susceptible to it now I definitely need to commit them to memory in case I’m in the back country again and don’t have access to a dr or the internet.